I always loved the cover of that hardback. An image of a tree dusted in snow, its branches still, somehow, laden with red apples. Kate Moses was the author of Wintering. I knew of her from the anthology of essays she’d edited with Camille Peri, Mothers Who Think. These were essays collected from the Salon column of the same name, which Moses and Peri co-founded in the late 90s. When the collection was published in 1999, I bought the hardback and scarfed it down. 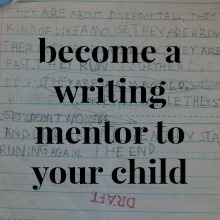 I was trying to write mothering essays of my own and there were few forums for that sort of writing at the time. There was no Literary Mama. There was no Brain, Child. It was hard to find the models I was hungry for. 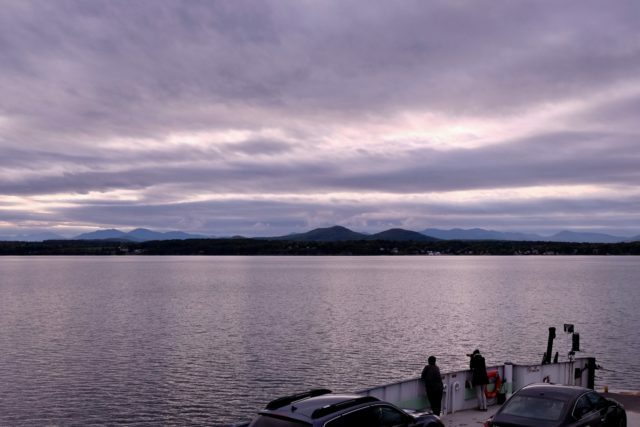 Crossing Lake Champlain two weeks ago, from Vermont to the New York side. Lake and sky vast and open. The sign in the neighbor’s window: We Love Art. The domed wooden cake stand in Kate’s kitchen. With cake inside. I’ve never had a mentor—for any length of time, at least. I never had that teacher who took a special interest in me, listened to what I liked to do, advised me on how I might proceed. I never had a counselor in high school who noticed any talent for writing I might have had, who told me that yes, I could major in English even if I hadn’t written for the school newspaper. (Why did I believe that English majors needed to be previously published?) I envied my English major roommate in college, but figured it was too late for me. I never found a mentor in the psychology department where I majored, or later, when I studied for my teaching credential and was so very into it. I never found a teacher who offered more than grades and a little encouragement. I was always a good student. Later, as an elementary teacher, I learned how easy it was to get consumed by the students who needed me most, and to overlook the “good” ones. My education made me feel anonymous. I wanted more for my own kids. 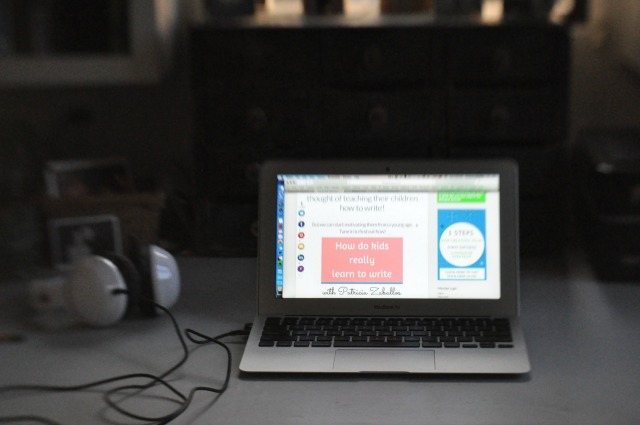 Homeschooling seemed like the opposite of anonymous. A tall room at the front of the house, lined with books, floor to ceiling. Letters forming the words Birds & Muses—the name for Kate’s literary services—lined up on the window, like sparrows. Remember how I called 2017 my year of rejection? In January I set out to make the new year better. I applied for a fellowship for women past fifty that I thought I had a pretty good shot at, and a mentorship that I’ve applied for three times now. I am sorry to inform you… We are unable to offer you….It was okay—I’m good at plodding along on my own. At the time I was inhaling the moving memoir Sirens by Joshua Mohr, and it included a scene with his MFA mentor, Kate, at USF. It turns out that it was not the USF professor Kate who wrote Wintering, but I didn’t know that yet. Curious about Mohr’s mentor I found myself on Kate Moses’ website. Reading about a program called Bookgardan: A Year’s Sustenance for Writers. 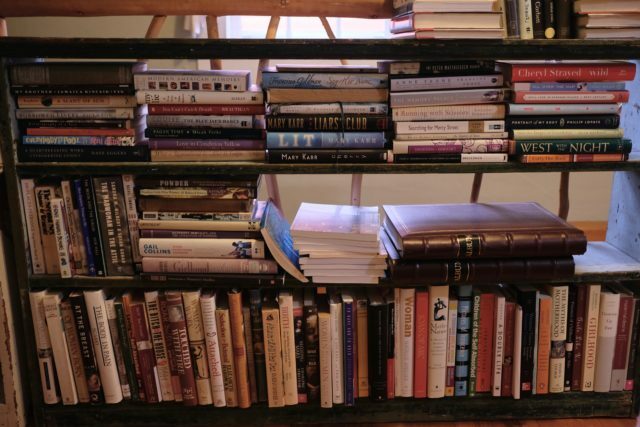 Bring your book project to full fruition in Bookgardan, a year-long program of sustained, one-on-one literary mentorship and monthly online craft seminars, bracketed by two fall residencies with an intimate community of fellow writers at Craigardan, a mountainside retreat for artists, makers & thinkers in the majestic Adirondacks of upstate New York. My heart flipped. I applied. The first applicant, I learned later. Outside my little guest bedroom–with the white ruffled comforter and the view of the garden–two full bookshelves of memoirs and essay collections. Two of the other five women from my cohort and I stayed at Kate’s beautiful house the night before we drove to Craigardan, the farm where we’d spend our first one-week residency. We stayed up late, getting riled up over Kavanaugh, eating polenta layered with Kate’s home-canned tomato sauce and her chocolate chip cookies, warm from the oven, yielding in our hands. A row of six empty Adirondack chairs, facing the actual Adirondacks. Those hills so red in the distance that they looked like the red rocks of Utah. But the red wasn’t dirt—it was a vast network of trees, entering a new season. 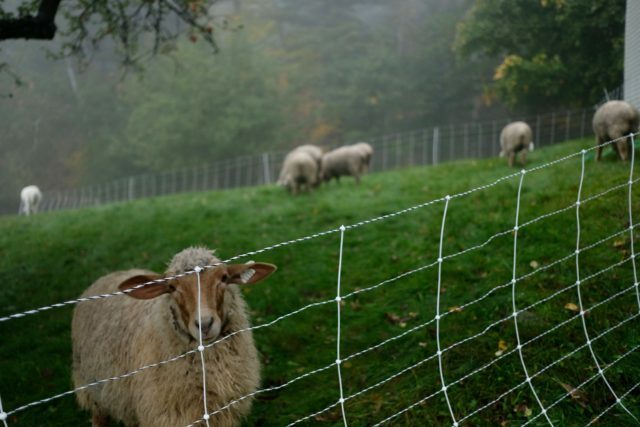 The sheep that came to welcome us, risking the electric fence for a scratch on the head. The impressionistic green, yellow, orange painting of a window in my little room. The tapestry chair with just enough window light for reading. The desk. I thought about the draft I’d submitted to Kate, the first chapter in my memoir, about the year we decided to homeschool. Several times in that draft I’d inserted an image of H, four at the time, belly-down, looking at a book. And one of his sister at 11 months, lying beside him on her own belly, chin in hand, flipping pages. It had never occurred to me why that image kept coming back to me. And then it hit me. That was the beginning of them learning to teach themselves. Not waiting for a teacher to tell them what to do. Just what I desired for them. Platters of simple, lovely food laid out every lunch, every dinner, by the young visiting chef from Australia. Frittatas, kale salads, pickled peppers, freshly baked bread gilded with nasturtium leaves. Many ingredients grown there on the farm. A circle of women reading their work aloud, late into the night. The way they leaned toward each other. The way they lingered. How Judy’s face lit up when we said she had a knack for dialogue. We’d wake early for yoga, bundle in jackets, head down the hill. Somehow, in the farmhouse where four of us stayed, I was the one marshaled for my sense of direction. I knew how to weave beside the sheep, to find the trail leading between the clay studio and the house where Mia laid out mats. The mountain through the window, in the distance, showing us how to hold ourselves in Mountain Pose. Mia at the front of the room, holding her hands open like a lotus blossom, Padma Mudra. Turning and offering each of us grace above muddy waters. Suzanne working at Maureen’s shoulders in the kitchen, kneading away a migraine. Kate coming through the front door each morning, wrapped in scarves, shawls, smiles. One night we watched the gorgeous Polish film Ida, about a young woman preparing to become a nun, who meets the aunt she never knew and the past the aunt carries. The black and white images lovely, slow, and resonant. We talked about those images the next morning, about how after the film, we saw our own hands placing dishes in a rack with wonder. One night Kate invited several local women writers to dine with us. 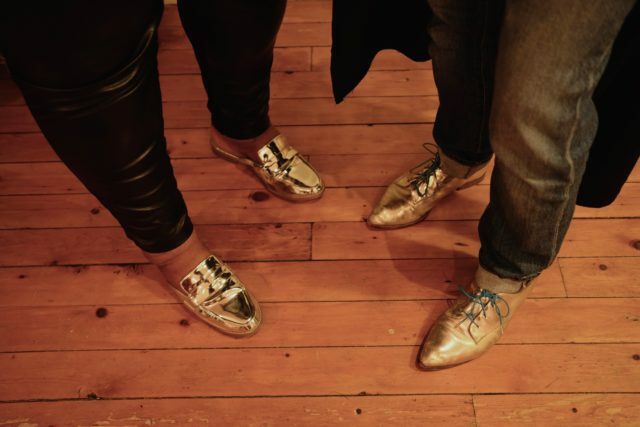 One of the visiting writers and one of our cohort writers both wore silver shoes. It seemed like a sign. We talked about our writing, the most flattering length for pants, the red tide in Florida. And shoes, silver and not silver. Our last night we gathered in Craigardan’s ceramic studio and received instruction from Michele, Craigardan’s director, also a potter. We sat at a line of wheels and learned how to brace our arms against our legs, to hold steady against the spinning wads of clay. Greer, the young chef, peeking her head around the kitchen corner each day, in a headscarf or handknit cowl, to receive our chorus of gratitude with a smile. Kathy across the table, telling me about her two grown children, the same ages as those two who were only yesterday sprawled on their bellies on the family room floor. 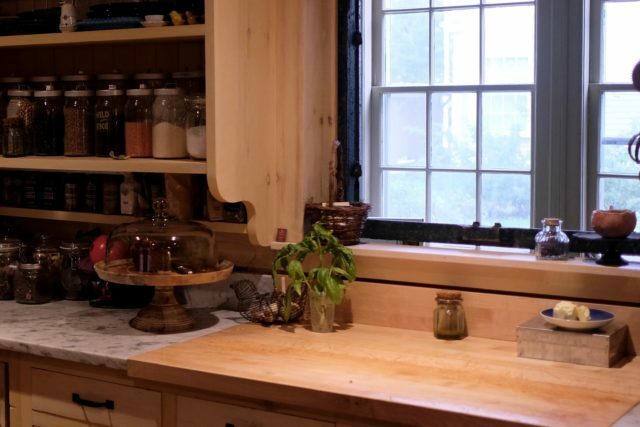 Kate, whisking up a batch of her New York Times-approved brownies in the kitchen, talking, laughing, while the rest of us lingered around the island drinking wine and tea, eating cheese, threatening to spoil the dinner that would be laid out and waiting in the apple barn. Hands warming around mugs of tea and coffee at the kitchen island. After yoga in the morning, between writing sessions, late at night—even when there were showers to be taken, work to be gotten to, clocks ticking late. We each had an initial one-hour meeting with Kate and later in the week, another lasting two-and-a-half hours. Who schedules back-to-back two-and-a-half hour meetings and never appears weary? Someone who loves what she’s doing. Kate sat beside me at a desk, shared her printed copy of my essay drafts. She’d underlined the images in my work, made asterisks in places of tension that moved the story forward. I’d given her two different essays, written from different points in my mothering—one early on, and one as a mother of grown children. She noticed connections between the two that I hadn’t seen myself. We talked about my motivations as a mother. I told her that, early on, I stopped thinking of myself as my children’s teacher. That I tried to see them as individuals, tried to help them blossom on their own terms. I explained this to Kate. I did not need to explain this to Kate. The nests in her house. Holding babies. Displayed among books. The metal tin of pralines she’d somehow made—late at night? 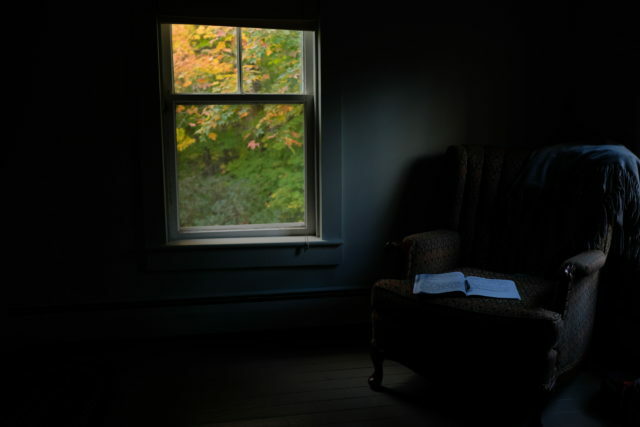 early morning?—left open on the farmhouse island, resting in a folded sheet of waxed paper, waiting. 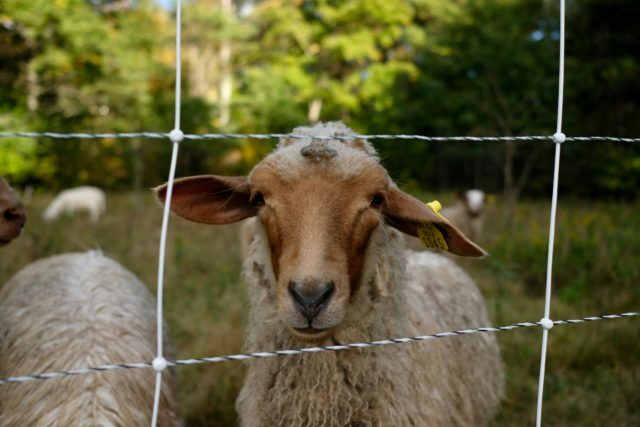 Their caramel brown the precise color of the muzzle of the sheep, our sheep, newly relocated to a fenced field outside the farmhouse’s door. 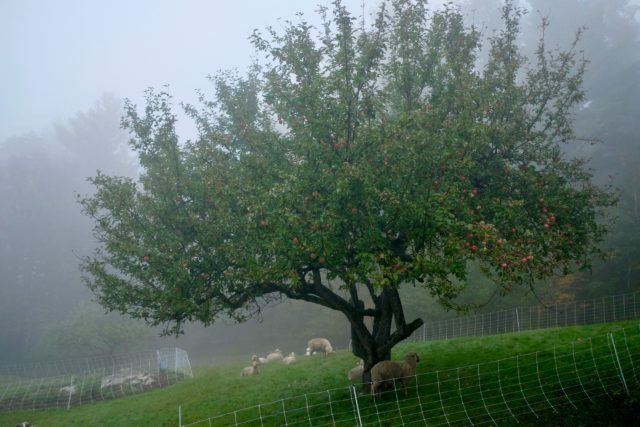 The apple tree outside the farmhouse, still laden. We marveled, my fellow writers and I, over tea and pralines. At how we’d come to know each other in a week of readings and meals and meeting up in the kitchen to fill the tea kettle. At how much Kate had seen in each of our drafts. At the year ahead, working on our projects alone, together. At another week at Craigardan next October. At how lucky we felt. Maureen chopping ginger for tea on Saturday night, offering mugs, stirring in honey by ample spoonful. 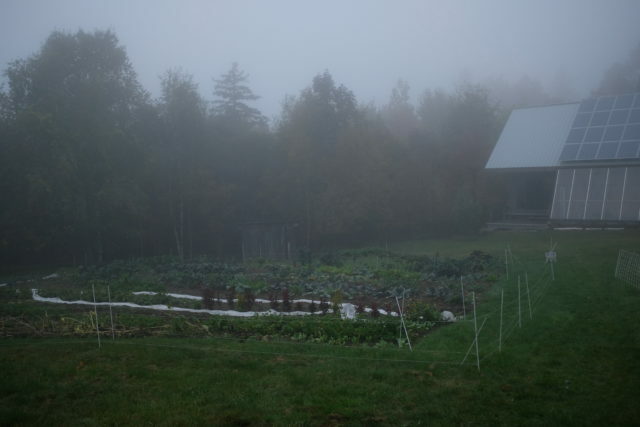 The mist that settled on the farm in the final two days, sealing us in, blocking out the red hills, the outside world. I won’t share the photo Kate took of us on our last day. I didn’t ask permission, so you’ll have to build your own image. 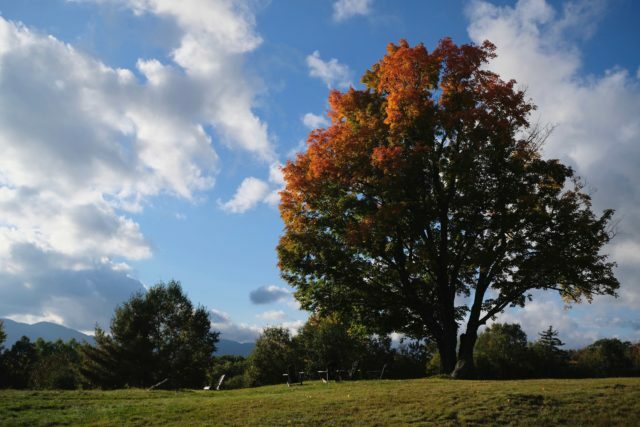 Make it look like this: A grand old tree—maple?—decked in yellows and greens, orange at the tips. Six of us, semi-circled beneath it, our smiles as wide as the branches behind. “Keep going!” we said as we hugged and set off toward our separate cars, trains and planes. “Keep going!” instead of goodbye. 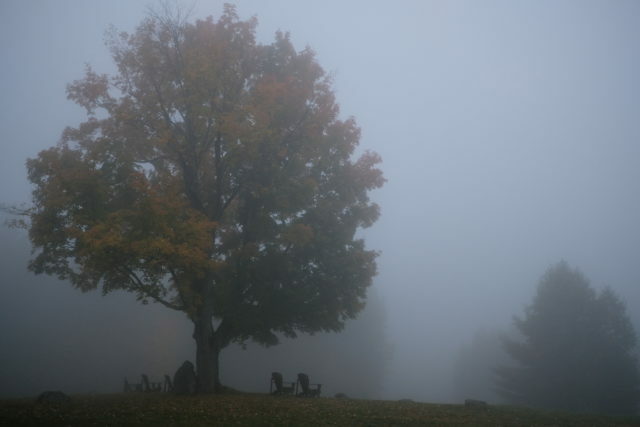 That tree in the mist. The Adirondack chairs below. Empty. Waiting. “I do believe that,” she wrote. Thank you for always coming back and reading, Sarah. I’m so excited to have this project finally underway! Aw thanks, Molly. It was incredible. I’m still on a high. 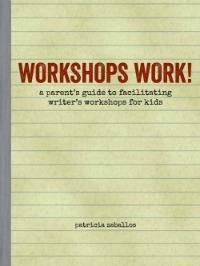 Patricia, I read this greedily, much the way you scarfed that book you mention early on. I particularly love this structure, these snapshots of images you offer us. What a unique and evocative way to allow us a glimpse into that retreat. Mary, there is nothing better for a writer to hear than that someone is reading her work “greedily.” Thank you so much! I’m pleased to hear that the images in the piece worked for you. 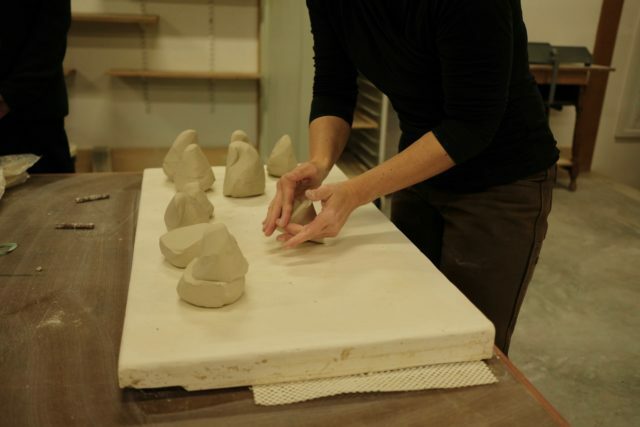 I wasn’t so sure, but wanted to play with what I learned at the residency–I’m holding so many images of my time there. I love having this space to experiment and play with form. I often find that my blog writing is a few steps ahead of my essay writing. And the best part is that readers show up to offer feedback to help me know what’s working. What a gift. xo. Yes, yes. This is what you were made for. I’m so glad you found Kate, an honest to goodness mentor! The retreat sounds perfect. I can’t wait to read your finished book. Ah, my artist friend, we’ve had so many talks about pushing along on our own, so you know what this means to me. Thank you for sharing in my delight. 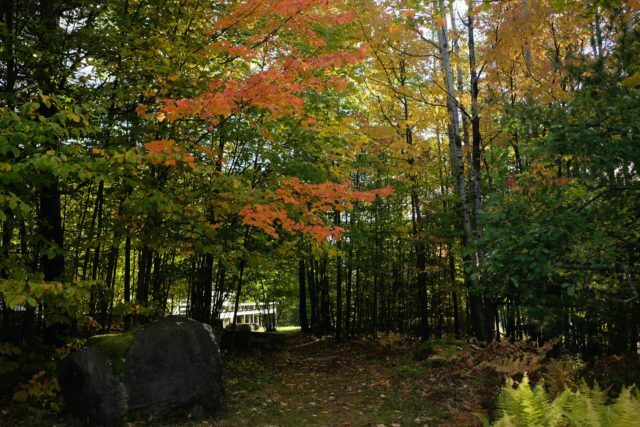 Thank you for sharing this ethereal experience in the Adirondacks and tying it to your personal journey. Your photos enhance the verbal images with their rich textural diversity. Looking forward to even more personal details at WT ! Thank you so much for reading, Gretchen–it means a lot to me. I’m looking forward to our time together on Sunday! I’m thrilled you found this program, this place, and these people. Your writing is beautiful and I learn something every time I read something of yours, be it a post on your blog or a submission for the class we took together. Who knows why things happen, or don’t, when they do (or don’t), but it seems clear it’s time for you and this book of yours to work its way out of you and into the world. Please keep telling us how it’s going. It’s always so good to hear from you, Jessica! Yes, it does feel like it’s finally time for this book to work its way out of me. I’m looking forward to reading your piece in Beth Kephart’s book! xo. Your excitement in finding kindred spirits is palpable! Congratulations and Keep going! Yes, kindred spirits–exactly! Thanks for continuing to come by and read, Jennifer! You’ve created such lovely images here. As someone else mentioned, I’ll happily read whatever you share in this space. Thank you! I look forward to reading more. And than you for continuing to come back and read, Cathy! It is hard to express how your writing moves me. 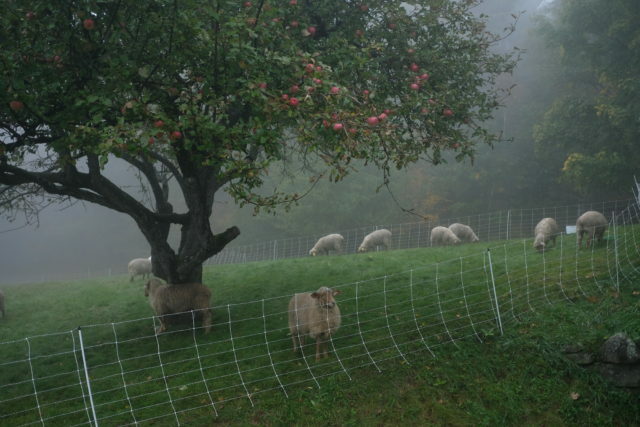 I reach out to wonderfarm when I need a combination of magic, authenticity, inspiration and warmth. Your ability to put the reader in your pocket and take them on the journey with you is so amazing. What I love about reading your blog is that I know you, I hear you, I see you, yet I always discover a little more about you. I cannot wait to read your memoir. Keep going!!! Oh, my friend. I don’t even know how to respond to this, it means so much to me. I swear I feel my heart warming in my chest. Thank you for being the reader every writer hopes for. Two chapter drafts down, eighteen to go! 🙂 xoxoxoxo. Thank you for sharing your beautiful and inspiring journey. I am so happy for you. Gabi, thank you for continuing to read! I was just thinking yesterday about our trip to Malakoff Diggins. Wasn’t that an experience? It may end up being a chapter in my memoir… I hope you and your family are well! It’s break, so I am catching up on reading. And I am so, so pleased for you. And this itself is so tender, you are so vulnerable here; it’s really beautiful. Amy, it means a lot to know that you save my words for when you have space in your life. I know you’re making the most of every bit of that break! (And I feel bad that I’ve let life get so busy that I haven’t pushed on scheduling an MMS meetup–but I think we’re all on the same busy-boat right now, huh?) Thank you for recognizing the vulnerability in this post. Yes, it’s there, and I’m learning to bring it to the page more as I work on this memoir. Which reminds me, gotta go and keep going! Enjoy the extra time with your beloveds this week. xo. A friend asked me for resources on home education recently. I struggled at first, because my kiddos are getting bigger (15, 13, 10), and we are so deep in it that I no longer need convincing. I started talking to them about what helped me and your work immediately came to mind. I ventured back here and fell back into your work. I keep up to date with the newsletter and IG, but I don’t make time to always read. I am so glad I did. It’s so good to hear from you, Heather! You’ve left comments here for years now, and I appreciate that. This message meant so much to me today. The writing has been slow-going for the past few weeks and reading these words at the start of my writing day today was so incredibly encouraging. Thank you for all that love–I feel it! xo.